In large skillet, heat oil over medium-high heat. Cook beef in oil 5 to 7 minutes, stirring occasionally, until thoroughly cooked; drain. Stir in 2/3 cup water and the taco seasoning mix. Cook over medium heat 3 to 4 minutes, stirring frequently, until thickened. Remove from heat. Separate each can of dough into 10 biscuits; flatten each biscuit into thin round. 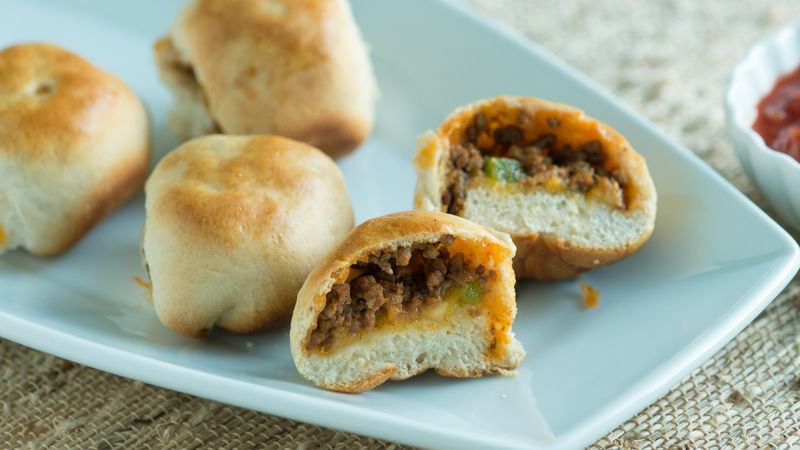 Spoon1 tablespoon beef mixture onto center of each round; top with green pepper and 1 cheese piece. Fold edges up and over filling; pinch to seal. Place biscuits, seam sides down, in baking dish. In small bowl, beat egg and 1 tablespoon water. Lightly brush tops of biscuits with egg mixture. Bake 15 to 20 minutes or until golden brown. Serve biscuits warm with salsa. Substitute onion, ripe olives or tomato for the green pepper. Queso dip is also good served with these taco-flavored biscuits.